Kouchner to French preSS correspondants: with regards to Iran, if the word "war" scares you, I won't use it anymore. That doesn't mean that bombs won't be involved somehow. It rejects euphemisms and linguistic taboos. If there is a risk of war, it should not be euphemized. Rather, it should be clearly stated and talked about, precisely to stop any escalation, before reaching the "catastrophic alternative." … Essentially, Kouchner has invited the Europeans to go beyond Moscow's stalling maneuvers at the UN, if necessary. It is said that when the wise man points to the moon, imbeciles only see his finger. When Kouchner talks about "war," many Europeans feel that it is a dirty word fired like a handgun into the subdued atmosphere of respectful negotiations. We think we know what we are talking about when we speak of "insurgents" and "Iraqization," but we err. The Spanish guerrilla war against Napoleon, the resistance against Hitler and the anti-colonial insurgencies were first and foremost directed against a foreign army, secondly against "collaborators" and lastly and only sporadically against the people in order to mobilize them by intimidation. In Iraq, the order of the targets is inversed. American troops are no longer the priority targets. The Americans lost 3,700 of their own in four years. During each of the "hot months" though, over 3,000 Iraqis lost their lives, mainly women and children, blown to pieces not by Americans but by the so-called insurgents. The Americans' frustration is due to the fact that they are facing an adversary who can kill as many of their own as they like, indefinitely, true to the motto "the more of our own we kill, the more you loose." …Today, homicidal and suicidal bombers are creating the implacable strategy of the scorched population. This is neither a resistance against an invader nor even a civil war, but, more diabolically, a war against the civilian population. None of this moves the Iranian mullahs, who, through the "moderate" former president Akbar Hashemi Rafsanjani, have declared themselves willing to sacrifice 15 million of their own for the theological glory of eradicating the Zionist entity, the necessary sine qua non for the universal hunting down of all crusaders and infidels. The sacrifice of one's own and oneself, the systematic self destruction of a whole people, are not a new and unknown pathology in history. However, none of these butchers, in their fury, had our modern nuclear toys at their disposal. To recognize this reality is to recognize why Kouchner was right to talk of war. Geneva - Racism in France is "alive, pernicious and most of its victims are French citizens from visible minorities, not immigrants," the UN's independent expert on minority issues said on Monday. "Because of the colour of their skin, their religion, their surname or their address, these young people in France see no chance of social mobility" said Gay J McDougall, after a ten-day visit to the country. Violence isn't senseless. Senseless violence is senseless. The Normandy bridges linking Ranville to Bénouville were the objective of the British 6th Airborne glider infantry, six of whose gliders landed noiselessly shortly after midnight on D-Day, i.e., six to seven hours before the actual seaborne landings started on June 6, 1944. Two years to go, and already the Brits are planning to celebrate the 65th anniversary of Pegasus Bridge with Project 65. When the going gets tough, the private sector gets going. Jesse MacBeth's answer was music to the ears of the left and their preconceived notions about poverty, crime and military service in America, writes Benjamin Duffy. Pride and joy and showcase for the late, great EU Lisbon Declaration, Galileo is now so hobbled that it will probably be obsolete before it ever reaches critical mass, if it gets launched at all. Kinda like the EU itself. It's like a French Enron, except that when the French PreSS talks about it, they never use the words "Enron", "capitalism", "greed", or any of the other vocabulary they routinely roll out for their anti-American screeds. ...and remember, when business is booming EADS is a French company, when it's in the crapper it's a European consortium. Someone get the viagra. Message to the French: get used to it, it's structural. Ségolène Royal publishes an op-ed article in Le Monde. When the News Seems to Reflect Negativaly on a Part of Former France, "Louisiana" Becomes "The South"
Then, in the French press, it was all about Louisiana, all about the former French state, all about the poor helpless victims. Now that the news concerns alleged racism and racial discrimination (within Louisiana as opposed to from without, i.e., by Bush's federal government) — relating to the Jena 6 — suddenly Annick Cojean reverts to "the South" and to "Southern justice" in the process of spending an entire page assuring us that nothing less than "America's" racism is at work here while using less than half a sentence to write about the arrest (emphasis mine) "of six black high school kids, accused of beating up a white male". Just when Airbus looked to be finally flying high with a new management structure and a new order from British Airways, dark clouds began to gather Wednesday with the opening stages of a major insider trading investigation. Et encore avec le winky-winky, there are sure to be mentions of it having "shades of Enron", but definately not the fact that even before there was an Enron and for time immemorial, European business executives would steal anything that wasn't bolted down, no matter what harm it did to the economy, and the very society they lived in. the investigation will focus on 21 executives across the three companies involved, who apparently sold EADS shares with insider knowledge that mounting delays and manufacturing problems in 2005 were becoming insurmountable. When the damage became public in mid-June 2006, after the executives had allegedly completed their stock sales, it caused EADS' share price to fall 26% in one day. The irony is that the people who are screwed by this are mainly small investors and retirees in Europe, and that more than half the reporting on this item comes from outside the "magical kingdom of Shengen." path, the comparisons get even better. Retired general Romeo Dallaire slammed France today during testimony at a landmark war crimes trial, saying the country helped those responsible for Rwanda's genocide escape to freedom. Everybody now, sing it! We are the world! We are the children! Testifying at the trial of Desire Munyaneza, a failed refugee claimant on trial for participating in the genocide, Dallaire said the French "push-back" force ended up helping the killers escape into neighbouring Congo. Meanwhile, back in charming Quebec, a Frenchman meets the welcome wagon which also has yet to do with anything in the US, but then again France Duh, and France Cinq have yet to report air it as the daily feel-good story at the end of the news. It has been credibly estimated that when the Bush drunk-driving story broke on the weekend before the 2000 election, some four to eight million evangelicals stayed home. Rather than stopping to think clearly about what a Gore presidency would mean in its totality, they just picked up their marbles and went home over that one issue. They were thinking more about their personal status vis-a-vis sin than they were the good of the country. They were thinking, I can't support someone who would sin in that way. I judge his actions to be sinful. My vote would be an endorsement of such behavior. How would that look for me before God? I, me, my. Me me me. Next great, whacky, and over-the-top European theory about the US soon to be formed. French State TV staged the Al Dura footage. Enh! Pfft! Ayeii! Mais C'est Charmant ! When invited to an LCI cable news talk show the author, when asked to rank France's world influence on a 10-scale, gave France a "4". The anchor, fully expecting something much closer to a "10" almost fell out of her chair. "La diplomatie française est en crise. Parce qu'elle n'a pas saisi l'importance des deux grands changements qui se sont produits ces vingt-cinq dernières années - la chute du mur de Berlin, le 9 novembre 1989, et les attentats contre le World Trade Center à New York le 11 septembre 2001 -, la France n'a pas adapté sa politique étrangère au monde moderne. Toujours prise dans les glaces de la guerre froide, notre pays a de plus en plus de mal à s'imposer sur l'échiquier international. Compromissions africaines, erreurs d'appréciation à l'Est, relations particulières avec les autocrates du Proche et du Moyen-Orient, antiaméricanisme : nos choix diplomatiques, dont l'efficacité n'est pas toujours au rendez-vous, heurtent de front les valeurs de la France, la patrie des droits de l'homme. Depuis l'élection de Nicolas Sarkozy, qui a promis une rupture de la politique étrangère française, les lignes diplomatiques ont enfin commencé à bouger. Ce mouvement sera-t-il suffisant pour permettre à la France de retrouver les voies de l'influence ?" 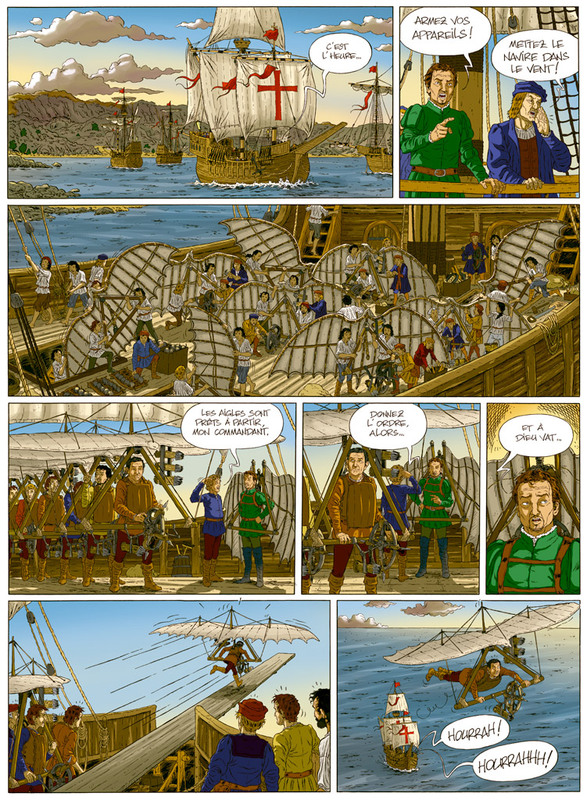 The second album of the adventures of Leonardo da Vinci (in bookstores on October 2) has the reluctant inventor of war-machines (gliders, tanks, scorpion vessels, etc…) forced to ship aboard the armada sailing for the Holy Land. The first mission of General Scharano's Crusaders (after their departure from the Italian peninsula, prior to their final goal of Jerusalem, and with the help of Leonardo's advanced weapons) is to bring relief to the besieged Knights of Rhodes (later the Knights of Malta) by launching a surprise attack on the Sultan's crack troops surrounding their outpost on this, the outskirts of the Ottoman Empire. Pick a veteran who agrees with them on the substance of a military issue, and then play up the fact of his service as cover for that position. …after three decades … the post-Clinton Democrats finally came up with a solution: Continue to oppose military spending, military deployments, and the development of military equipment, but tell everyone how much you love and support the troops. …The Hollywood left (which, having lived and worked in Hollywood, I can tell you is mostly left) is pumping out more and more brazen examples of the standard military-slurring films. In the last few years, however, they've also begun departing from their regular fare of "supporting" the troops by portraying them as dysfunctional, broken, war-addled victims to making films that directly portray them as war criminals. …For many months now, I have been pointing these things out, and each time, I have said, don't believe their "we support the troops but not their mission" drivel---it's just a smokescreen, and it won't last. And sure enough, that is coming to pass. asks David Kahane (thanks to Christopher Cook), aping the thoughts of Hollywood bigwigs after their films ("movies, lots of ‘em, each with a stronger antigun, antiwar, anti-Rethuglican message than the next") bomb at the box office. We support the troops, showing them as the dysfunctional, murdering, drug-addicted, red-state crypto-rapists in need of psychoanalysis we all know they really are. Hey — even the Marine officer in Alan Ball’s award-winning American Beauty a few years back was humanized by making him a sadist and a closet queen. And this is the thanks we get? Travailler ? Very Shocking ! A french expatriate to South Africa returns home, only to see his fellow countrymen in the clear light of day. His advice? Get a damn job! [For all the difficulty of finding a job] you might tell me – that there is such a thing as temping. Of course I pursued that line of thought conscious of my handicaps after several years away from France. The whole thing turned into a joke. Thus, while presenting to me, I told the recruiter that I seek all types of work, even if they don’t have much to do with my qualifications because I’m in a pinch. In general, your interlocutor either raises their eyebrows, does not quite understand what you’re saying, given your CV, or you looks at you like you’re an idiot, as if you were '' disturbed '' (no, really!). At the end of the day, you come away with the despairing feeling that you’ve been talking to a tree. Another thing we spoke about was working abroad using my English speaking skills. His advice and posture repeated any one of the many assets listed in my CV, just to get through it quickly. Because in reality, if you did not follow the traditional path, the recruiter will get flummoxed and loses his frame of reference. You just dropped off of his radar. No good! Come again later after you’ve '' reintegrated". Must be tough running the best, most flexible, most you name it economy in the world. Dans le même temps, me direz-vous, il y a l'intérim. Bien sûr que j'ai regardé de ce côté conscient de mes handicaps après plusieurs années hors de l'Hexagone. Le parcours tourne parfois à la farce. Ainsi, en me présentant, j'explique que je recherche tous types de mission, même sans rapport avec mes qualifications car je suis dans l'urgence. En général, votre interlocuteur soit fronce les sourcils car ne comprend pas votre requête au regard de votre CV soit vous regarde en oeil de pigeon, comme si vous étiez ''dérangé'' (certainement !). Au bout du compte, il en ressort un dialogue de sourd plutôt désespérant. Autre élément dont ont nous parle : l'ouverture sur l'international, des expériences à l'étranger et la maîtrise de l'anglais. Autant d'atouts dans son CV. Des mots, des discours et des postures. Pour faire vite du flanc. Car, dans la réalité, si vous n'avez pas suivi les rails classiques, le recruteur est déstabilisé, perd ses repères. Vous n'entrez plus dans sa grille de lecture. Pas bon ! Repassez plus tard quand vous vous serez ''réintégrez". Merci.